Think of this as your little one’s introduction to the wonderful world of smoothies. Mixing zingy, tropical mango with sweet pear and kicky kale, there’s plenty here to put a smile on tots’ faces. When you eat organic, you don’t need a degree in chemistry to recognise the ingredients in your food. That’s never more important than when you’re choosing what to feed your little ones. Piccolo purees are pure, organic fruit & veg and all natural ingredients you’d find at the farmers’ market, not the laboratory. Nothing tastes better than lovingly-prepared food. That's a philosophy that Cat Gazzoli, the heart behind Piccolo Food, grew up with and is now putting into practice for her daughter Juliet. Her Mediterranean roots have inspired her to create good, fresh and honest recipes. 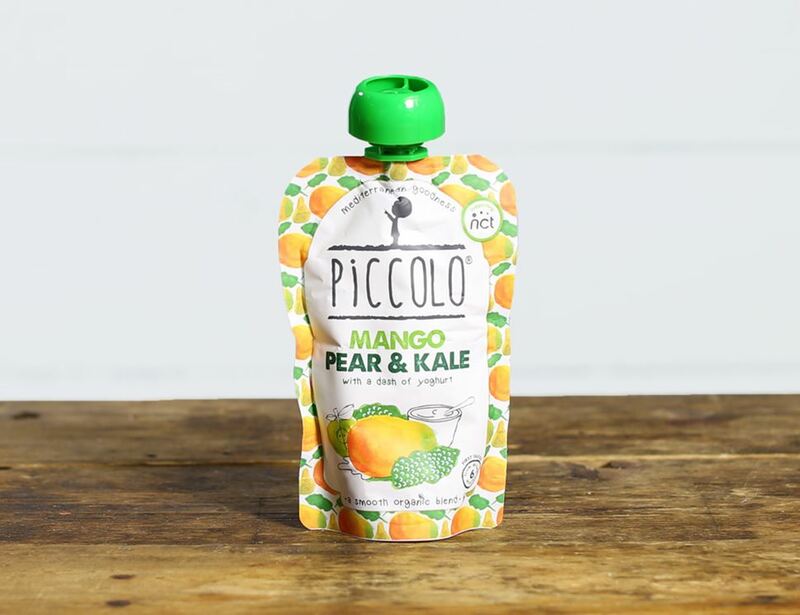 At Piccolo Food they believe sprinkling some Mediterranean goodness on things helps develop little ones' taste buds when it matters most, and we couldn't agree more. Piccolo gives 10% of its profits to food education and works in partnership with the NCT. Pear* (26%), Apples* (24%), Mango* (20%), Kale* (20%), Yoghurt* [milk*] (10%), Lemon juice concentrate*. For allergens, including cereals that contain gluten, see ingredients in bold. Store in a cool, dry place. Once opened keep refritgerated and consume within 24 hours. Not suitable for home freezing.